My husband, Francisco, went to Japan as a foreign-exchange student when he was in high school. It seems improbable now, but his host family were urban rice farmers, with fields in cultivation all over Kyoto. They owned larger paddies outside the city, but still farmed every parcel of land they could, including one shady patch wedged between a bank and a tall apartment building. I’m keeping Francisco’s host family in mind as I watch the urban-homesteading movement gain momentum. I’m especially interested to know what homesteaders and gardeners choose to cook with their bounty grown and raised with so much purposeful effort. Francisco says that by Japanese standards, his host family’s home was a mansion, and they were able to keep two chickens. I think it's safe to give significance to what the mother of the family chose to make with her chickens' eggs, which was often chawan mushi: delicate savory custard steamed and served in small cups. Here's why: Chawan mushi’s custard is a blend of egg and dashi, the Japanese stock typically made from steeping kombu (edible kelp) and bonito flakes in water. The resulting custard is jiggly, light, and silken, freed as it is from the fats and protein of the cream that Westerners pair with eggs for custard. On its surface, you may find a leaf of the complex herb shiso, or of mitsuba. Mitsuba is also known as Japanese parsley, but it tastes of celery. These garnishes provide an initial dash of vivid green flavor. The New York Times recently reported on the precarious state of Japanese rice growers. 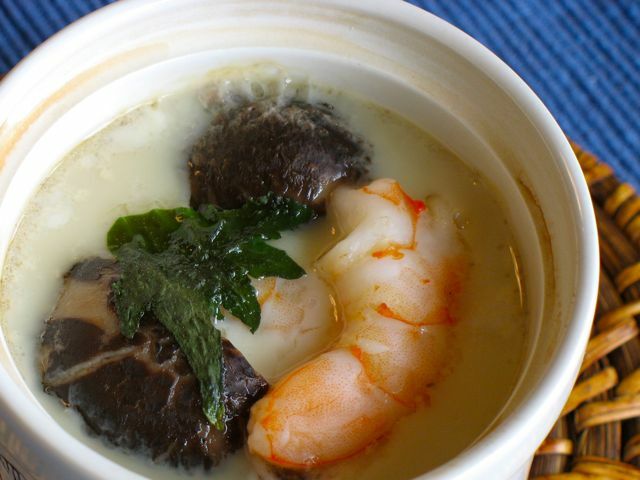 And Mark Bittman's Times blog, Bitten, includes a recipe for chawan mushi. Underneath, a mere few pieces of shrimp, chicken, or mushroom (shiitake, shimeji, or maitake) hang suspended in the opaque custard. Finding one of these feels like a discovery. Gingko nuts and slices of kamaboko (a surimi product) are also common in chawan mushi. Near the bottom of the cup will be some of the dashi, which has separated from the egg as it sets up. This tends to surprise first-timers, as they break the custard surface and see a clear liquid well up from the break. It’s a good surprise, though. By itself, dashi tastes of minerals, and a little smoky from the bonito. Tasting it made me imagine I was drinking seawater without all the salt. Dashi's job is to emphasize all the flavors that surround it. It does this quite well thanks to kombu’s high levels of naturally occurring glutamate (think monosodium glutamate). Glutamate is the amino acid responsible for umami, or the fifth taste. When I tried to substitute chicken broth for dashi, the resulting chawan mushi was disappointing and one-dimensional. I don’t usually think of chicken broth dominating other foods, yet I found it disruptive to chawan mushi’s balance. I did not hesitate to go back to dashi, which takes only 20 minutes to make. Besides sticking with dashi, the other key points to making chawan mushi have to do with knowing when to stop. First, be sure to fill the cups no more than one-third of the way with whatever fish, vegetables, and chicken you are using. Treat these additions as accents to the custard, not as bulk or filler. Next, avoid overcooking. Left too long to steam, chawan mushi becomes dashi soup with pieces of egg floating in it, not creamy custard. Gently shake the cup to test for doneness. Chawan mushi is ready when it looks set up but is still quite loose in the middle. If the custard is close to done, I check it every three to five minutes. With eggs, the window between liquid and overcooked is narrow. After a cold March farmers' market, I brought home some nettles and used a few leaves to anoint a warming batch of chawan mushi. This savory Japanese custard is a light, elegant way to enjoy the season’s rich eggs, and the perfect canvas for those first few leaves of spinach or the littlest, tenderest fava beans.